Sometimes I plan to be active, but it doesn’t work out. Yes, mini-golf counts as being active! and we tried very hard to hit two different courses near me, but it just didn’t work out as one was closed because the season hasn’t started yet, and the other one… it was too late (ahem, and that is why I said 4pm is too late!). Anyway, despite our non-exercise of driving around in frustration, we decided to grab dinner in Flushing since we were nearby … sort of … before heading into Manhattan to meet friends for dessert at Spot Dessert Bar (which I did not document, but trust that I enjoyed it as usual). I think, given the choice of just about anything to eat vs. hot pot/shabu shabu, DLS will choose hot pot… so we went to Minni’s, my previous favorite hot pot restaurant (though I haven’t been in years; the reason I liked them best was because they were the only place that included hoisin sauce on its sauce table… but this time we went, it was no longer there, boo). 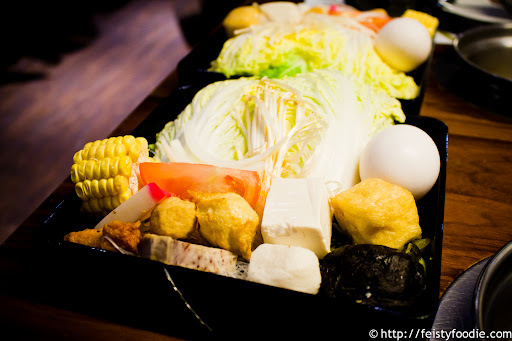 The above were our veggie trays – the normal assortment of corn on the cob, meatballs (fish balls, fish cakes, etc. 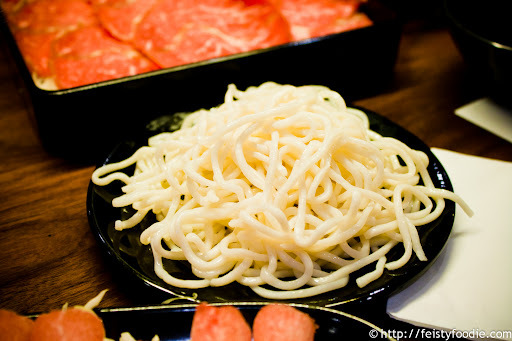 ), tofu, cabbage, glass noodles, and a bit of udon. 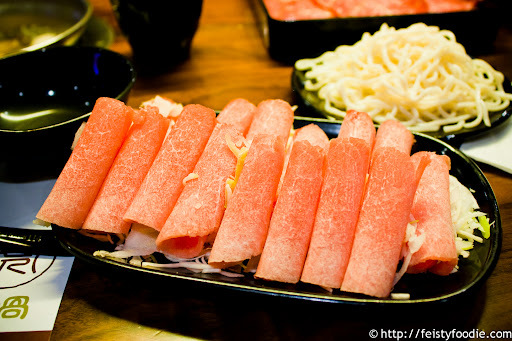 My order of pork slices – I wanted to get something different from my usual beef. Not bad, but not special either – I’ll stick to my beef next time! Mr. Fancy Pants (new nickname?!) went with wagyu. I tried a piece and while it was extraordinarily tender, it also fell apart super easily. I didn’t think this cut of beef lent itself well to this style of cooking… and DLS complained about it falling apart so easily. And even though we were headed into the city for dessert afterwards, DLS wanted shaved ice, so shaved ice we had. “Condensed milk and red beans, what do you want?” since it came with three choices. I chose corn. Yeah I did! It’s so good! And I genuinely preferred the corn with condensed milk and ice to the red bean, which I found a little too sweet – though DLS had no problem eating most of this, hahaha. Yvo says: Not the best quality shabu shabu I’ve had but definitely good, wth a nice, large, clean space, servers who didn’t try to spill boiling broth on me. They weren’t attentive – they probably could have sold us more food if they’d paid more attention to us… but eh, that’s what you expect at most places in Flushing! Minnis has improved a little from yrs past. (my dads boss owns itso we used to go a lot) no matter where there’s always something a little wrong with the places.. quality of some items, not being able to get the items i want, or crazy lines. That’s why I mostly just do hotpot at home. I get exactly what I want, the quality i want, and enough of it. I like the little fat lamb spicy pack to flavor the broth. delicious! but sometimes you just do not want to do the work. I go to little fat lamb on main st then, or anywhere ppl make me go.. la mei, baidu. will just never go to shanghai tang. fat lambs white soup is delicious although msg laden , and portions for some items small..and crowded unless you arrive early.. but love it. ok long comment. 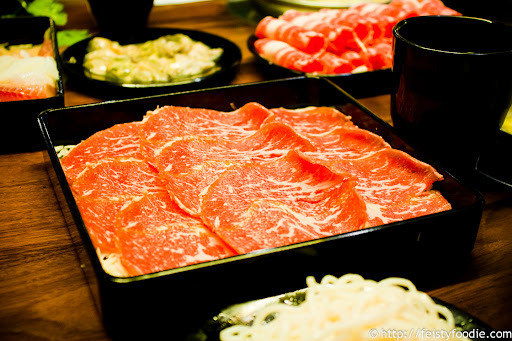 I feel terribly strongly about hotpot though. 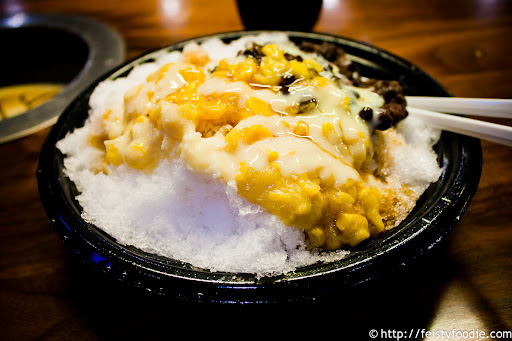 Shaved ice with corn. Never tried that before..
Really? I had it all the time growing up. Malaysian places have 7-style-ice and it’s in there (along with grass jelly, black jelly, red bean, condensed milk, don’t ask me what else…). I’ve had shaved ice before with all the other things you’ve listed, but I don’t recall corn at all. Did you get individual pots here? Yes! That was another reason I liked this place a lot. Do you want to try some of Ellen’s suggestions above with me? Just saw an ad in the movie theater for the Little Lamb place – looked good, but shared pots. Boo… hahaha!